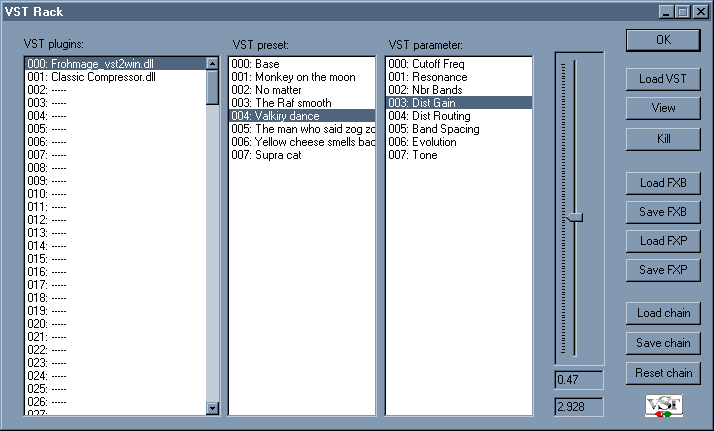 Click on the VST rack button under the transport bar brings up the VST rack window. Check the processing box to hear in real time the audio processed by the VST effects. Click on the apply button to apply the effect to your file. shows up the GUI of the VST effect. Double click on the VST name opens the VST GUI too. Note : after applying an effect don't forget to uncheck the "processing" box unless you want to hear your file (re) processed again.